Nashville, Tenn. (November 16, 2017) – As fan demand accelerates, superstar hitmakers FLORIDA GEORGIA LINE and PLATINUM-selling Pop star BEBE REXHA are releasing their hot new collaboration “Meant to Be” to Country radio today. Already a digital smash breaking into Spotify’s Global Top 50, sitting at #5 on the iTunes Top Songs chart, and amassing over 80 million streams globally, the pairing originally was not conceptualized as a Country single yet stations organically began spinning the song. Hubbard co-wrote the laid-back jam with Rexha, Josh Miller and David Garcia in sunny California. 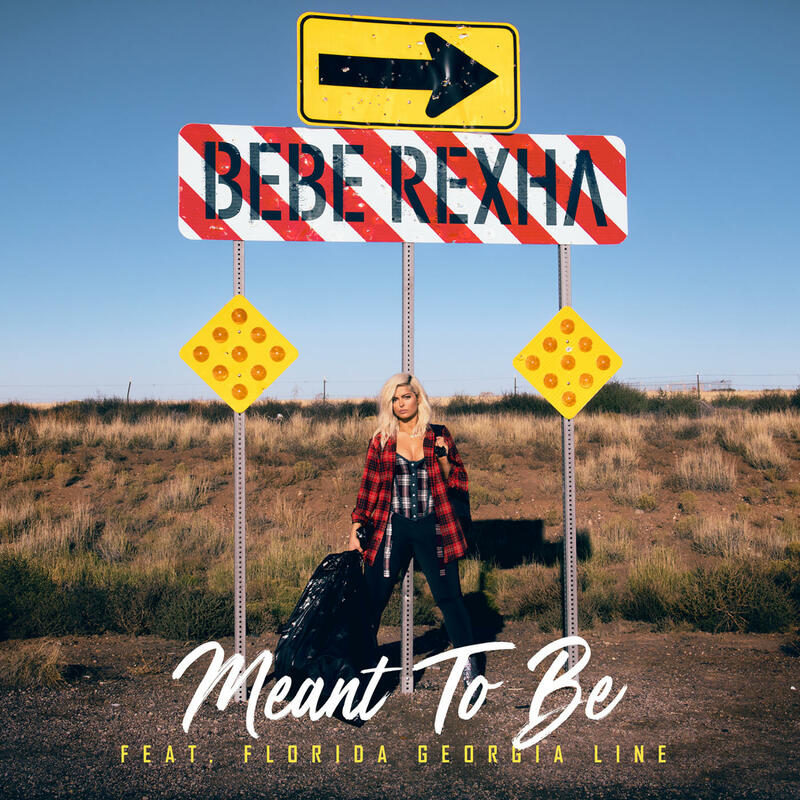 The vibe inspired “Meant to Be,” a song about living in the romantic moment, which appears on Rexha’s new EP, All Your Fault: Pt. 2. Filmed in New Mexico with director Sophie Muller, the free-and-easy music video is also making a big impression on fans, having already racked up more than 42 million YouTube views. Meanwhile, FGL and Rexha bring their on-screen chemistry to the first national TV performances of “Meant to Be,” appearing on CBS’ The Late Late Show with James Corden tonight (12:37 a.m. ET/11:37 p.m. CT), and during a special, on-demand presentation for Comcast’s Xfinity customers following the 2017 American Music Awards on ABC on Sunday (11/19) – where the five-time nominees are vying for the fan-voted Favorite Duo or Group – Country. FGL is currently back in the studio working on a new album, the follow-up to their groundbreaking 2016 release, DIG YOUR ROOTS (BMLG Records). Pushing the duo into a bold new stylistic territory and helping them achieve stadium-headliner status, the project included the 3X PLATINUM-certified lead single “H.O.L.Y.” and PLATINUM-certified hits “May We All” (featuring Tim McGraw) and “God, Your Mama, And Me” (featuring Backstreet Boys). FGL’s PLATINUM-certified musical evolution, DIG YOUR ROOTS, propelled the history-making duo to #1 on the all-genre Billboard Artist 100 and Country Albums charts. Continuing the epic momentum, the album has delivered three consecutive #1 smashes – the 3X PLATINUM-certified lead single “H.O.L.Y.” [#1 on the Billboard Hot Country Songs chart for 18 straight weeks] and PLATINUM-certified hits “May We All” (featuring Tim McGraw) and “God, Your Mama, And Me” (featuring Backstreet Boys) [13th #1 overall as artists]. Following a landmark DIG YOUR ROOTS TOUR that broke attendance records and reached over one million featuring headline-grabbing guest appearances, FGL just wrapped THE SMOOTH TOUR 2017 – having played select sold-out stadium dates this summer with special guests Backstreet Boys. Bursting with first-rate reviews of their explosive live shows, MusicRow Magazine praised, “Just in case you’ve forgotten, Florida Georgia Line is one of the hottest country acts alive.” The top-shelf entertainers continue to crush records as the first and only Country act to achieve RIAA’s DIAMOND certification (10 million copies sold) for their breakout smash “Cruise,” which is the best-selling digital country single of all time (SoundScan). Since their breakout in 2012, FGL has earned prestigious honors from the AMA, ACM Awards, CMA Awards, Billboard Music Awards and CMT Music Awards. Their previous BMLG Records releases – 2X PLATINUM debut HERE’S TO THE GOOD TIMES and PLATINUM ANYTHING GOES – have attributed to sales surpassing 30 million tracks and more than 4.2 million albums worldwide. FGL is spreading good vibes to sports fans each week during the 2017 NFL season as they’re featured alongside Hank Williams Jr. and Jason Derulo in “All My Rowdy Friends Are Coming Over Monday Night” during Monday Night Football on ESPN. Their genre-smashing collaborations also include teaming up with The Chainsmokers for “Last Day Alive” (MEMORIES…DO NOT OPEN), Bebe Rexha’s “Meant to Be” on her recent EP All Your Fault: Pt. 2, and Hailee Steinfeld & Alesso’s latest single “Let Me Go” (featuring watt). Fueled by fresh inspiration and keen entrepreneurial spirit, they’ve launched publishing company Tree Vibez Music and their own emoji app, FGLmoji. Following the introduction of their Old Camp Peach Pecan Whiskey, their premiere restaurant and entertainment destination FGL HOUSE, a four-story attraction with the largest “Cruise” rooftop Nashville has to offer, is now open. Singer/songwriter Bebe Rexha has accumulated over 10 million overall single sales, 3.25 billion total global streams and a radio audience of over 10 billion. She hit #1 on both the Billboard Pop and Rap charts with her Platinum-selling smash single “Me, Myself & I” with G-Eazy. Her single “No Broken Hearts” featuring Nicki Minaj has over 217 million YouTube/VEVO views to date, she is featured on Martin Garrix’s single “In The Name of Love” which already has over 231 million YouTube/VEVO views and “I Got You,” has garnered over 199 million YouTube/VEVO views. Bebe Rexha burst onto the scene in 2013 when she penned the song which became a worldwide hit for Eminem and Rihanna—“Monster” – which went RIAA quadruple-platinum stateside. She wrote and featured on Cash Cash’s “Take Me Home” and Pitbull’s “This Is Not A Drill” in addition to writing Tinashe’s “All Hands On Deck” and Selena Gomez’s “Champion.” Her 2015 debut EP, I Don’t Wanna Grow Up (Warner Bros. Records) boasts the singles “I Can’t Stop Drinking About You” and “I’m Gonna Show You Crazy,” which racked up over 52 million Spotify streams in only six months. That same year, she co-wrote and carried instantly recognizable hooks for the double-platinum “Hey Mama” by David Guetta, Nicki Minaj, and Afrojack which was nominated for a Billboard Music Award for Top Dance/Electronic Song, as well as the Billboard Hot 100 smash “Me, Myself, & I” with G-Eazy. Bebe released her debut album, All Your Fault: Part 1 and All Your Fault: Part 2 this year to rave reviews. In addition, she is also featured on Louis Tomlinson’s track, “Back to You,” off of his upcoming solo album. Her most recent single, “Meant to Be” with Florida Georgia Line, is currently climbing the charts and has amassed over 80M global streams to date.